GROOVE LINEAGE – a musical idea, radio show, a club night & now an e-Magazine. Sunday September 13th 2015 at Mote Park, Kent. 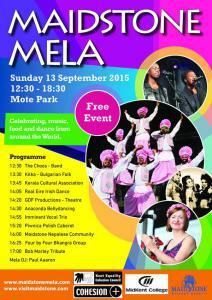 KTF’s Paul Aaaron will DJ Soul, Reggae, Soca, Latin and roots music from across the globe at the Maidstone Mela Festival 2015 on Sunday September 13th 2015, 12.30pm-6.30pm at Mote Park, Maidstone, Kent, ME15. A free entry, family festival with live acts, music, dance and food from across the globe and featuring local acts. The festival attracts 20,000 people each year and is set in the idyllic surroundings of Mote Park, Kent. Maidstone Mela was the first Multi-cultural Mela om the UK featuring the many cultures of Maidstone and Kent based people and led the way for similar events across the UK. This year the music of Bob Marley is celebrated with The Trench Town Experience live + many more acts live on the day + stalls and fair attractions.